A lucky bamboo brings good fortune and prosperity for at least a year. Unless it dies, in which case, according to legend, the owner is in for 29 years of bad luck. 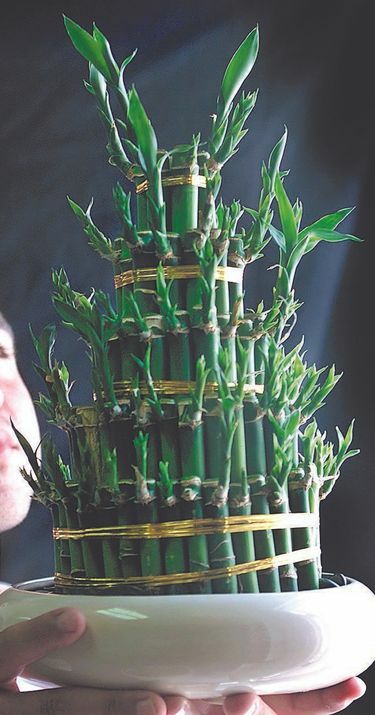 If you attend a New Year’s Eve party this year, surprise the tweedle out of your host by bringing him or her a lucky bamboo plant. These attractive, practically indestructible tropical houseplants aren’t really bamboo but actually Dracaena sanderiana. They make great holiday gift plants because they thrive in low light and can survive for years in a pot filled with only pebbles and water. Best of all, according to Chinese folklore, anyone who receives a lucky bamboo as a New Year’s gift will experience good fortune and prosperity for at least the following year. Lucky bamboos are available in all sorts of shapes and sizes. The ones with intricately braided or twisted stalks can be quite expensive, but most nurseries offer lucky bamboos potted up in small attractive containers for less than $20. 9:30 a.m. to 11:30 a.m. Friday, Jan. 6. The first lecture in the group’s annual Sustainable Garden Winter Speaker series. Steve Smith of Sunnyside Nursery will present “Banish Boring Yards Once and For All.” Cost: $85 for a pass to all eight winter lectures. Address: Mukilteo Presbyterian Church Social Hall, 4514 84th St. S.W., Mukilteo. 10 a.m. to 7 p.m. Friday and Saturday, Jan. 6 and 7; 10 a.m. to 5 p.m. Sunday, Jan. 8. Enjoy hundreds of exhibits and demonstrations. I will be speaking at 1 p.m. Sunday. Cost: $8 adults, $7 seniors and military, free under 17. Address: Washington State Fairgrounds, 110 Ninth Ave. S.W., Puyallup. 10 a.m. to noon Sunday, Jan. 8. Ingela Wanerstrand will teach the basics of fruit-tree pruning, covering apple, cherry, plum and pear trees. Cost: $25 general public, $20 PlantAmnesty members, $5 horticulture college students and native Spanish speakers. No preregistration necessary. Address: Sand Point Magnuson Park, 6344 N.E. 74th St., Seattle. If you prefer to add a personal touch, you can buy the rooted stems separately and pot them in the container of your choosing. Simply stand the stalks in a narrow vase, and fill in with enough small pebbles to support the stems, while making sure all the roots are covered. Then pour in water to just below the surface of the pebbles. As an additional touch, tie a ribbon around the pot with care instructions. Lucky bamboo requires minimal care: Simply refill with water to maintain a constant level and replace the water completely about once per month. Distilled water is best. Tap water won’t kill lucky bamboo, but over time the fluoride, chlorine and other chemicals it contains cause the edges of the leaves to turn brown. By the way, when you give the host lucky bamboo, don’t mention that if it dies within the first year, it brings 29 years of bad luck! When I worked as a gardener at Seattle University, an old priest taught me how to use hardwood cuttings to make new plants. I’ve always been grateful to him because I’ve found it to be one of the easiest methods to propagate deciduous trees and woody plants such as roses, dogwoods, figs, grapes and many others. The best time to take hardwood cuttings is in January. Use sharp, clean pruners to take 1-foot long, pencil-width cuttings from the ends of branches. Make the cut ¼ inch below a leaf node. Then prune off the top 2 inches from the cutting, making a slanted cut just above a leaf node. Use your pruners or a knife to scrape a narrow, ½-inch long sliver of bark from each side of the base of the cutting. The object is to expose the light-green cambium underneath. Next, dip the bottom end of the cutting in rooting hormone (available at nurseries and garden centers). Plant the treated cuttings in gallon-sized nursery containers filled with a 50-50 mix of peat moss and perlite, leaving the top two buds exposed. Bury the pots outdoors in the ground or in large containers (with drainage holes) covering all but the top buds with soil, compost or wood chips to protect from freezing. Locate the cuttings where they will be protected from direct sun and wind. In spring, you should notice new growth. During the following spring and summer, make sure the rooting medium stays moist. Your new plants should be ready to plant in the garden by fall.